UMS Holdings is a Singapore Precision Engineering Group that carries out Contract Equipment Manufacturing and Semi Conductor Manufacturing. It is in a business that really has not much moat. If you are a firm looking for solution of precision components, all you need to do is find a precision engineering firm with competency and deliver at the lowest cost. So why am I talking about a firm like that in this space? UMS have been a mediocre engineering company until 2010 where it got into a close partnership relationship to manufacture semiconductor components and complex assembly and testing for Applied Materials, a US listed wafer fabrication machines provider. Since then, majority of the revenue derived have been linked to Applied Materials. Applied Materials owns 6% of UMS. And its quite unique that even before 2010, AMAT already is a shareholder, stemming AMAT’s relationship with Andy Luong, UMS’s founder. AMAT provides the manufacturing equipment means for the semi conductor foundries. 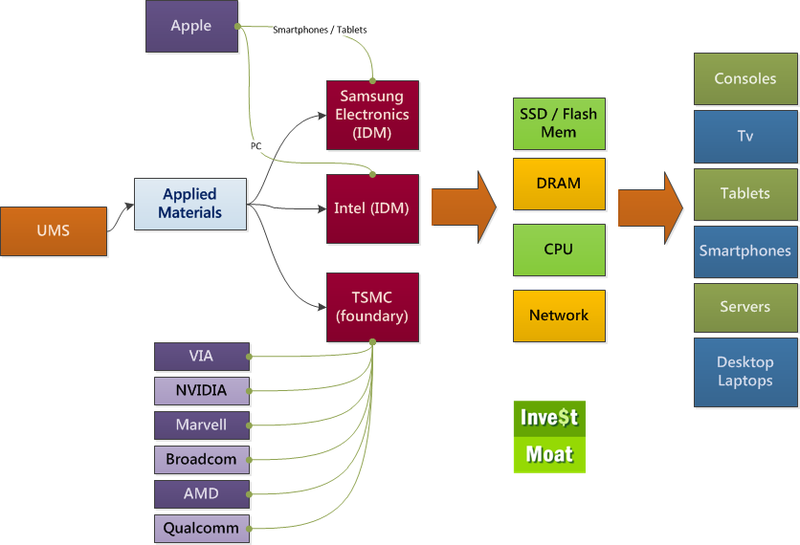 By that, it will include Samsung, Intel and TSMC. As the manufacturing process is delicate, complex and defects / failures are costly, the brain of the process are the equipment. The foundries don’t typically save on that. we know that the semi conductor industry is cyclical but with that rapid advancement in technology, and the need to keep up with producing the best semi conductor components. This means that, despite down cycles, as Intel is experience recently, they have to invest in equipment to move up from 28 nanometer to 20 nanometer manufacturing. Chartered Semiconductor used to suffer greatly from this. Where AMAT comes in is that they have a dominant market share in the equipment. This does not make them counter cyclical, and they do suffer together with the industry. However, the nature of the industry is such that they should have adequate business from the 3 dominant foundries. UMS partnership with AMAT means that their fortunes are tied closely with AMAT. If AMAT does well UMS does well. This will mean that as an investor, you probably need to look at AMAT’s results as well. UMS currently trades at 46 cents. Based on the last earnings the PE is around 7 times and they are trading below PTB. This 2 metrics may show that the company is undervalue, but more so, it shows the riskiness of the underlying earnings. From the price chart you can see that in 2010 the partnership was inaugurated the price profile changes. Price took a dive in mid 2011, amid weakening semi conductor industry. The attractiveness is of course its 5-6 cents dividend. That is not pushing it. A 6 cents dividend requires $20 mil. They currently are net cash of $15 mil. A more reasonable target is a 4 cents yearly dividend. That will need $13.7 mil cash or $3.43 mil per quarter. In the last quarter (read report here), the net profit have been $2.129 mil which is much lower than the $3.4 mil required. 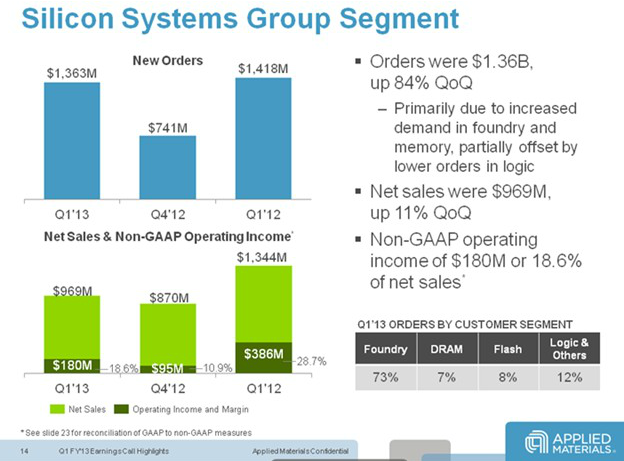 But free cash flow was, $8 mil. A lot of the dividends can be paid by the amortization and deprecation of nearly $2.8 mil. As with Starhub, there are periods where you will expect higher capex, and therefore in the long run, free cash flow should equal to net profit. I look at UMS’s change in dividend policy since 2010 to pay a quarterly dividend to be a sign that the management sees much more consistency in cash flow generated versus before they be AMAT’s provider. Another aspect of the payback to shareholders have been share buy backs as atest by the limited growth of the equity base. We do hope to see more buy backs during down cycles, which is usually not the case. The difference between UMS and other precision engineering firm is probably their ability to do complex assembly of semi conductor equipment and testing. This will be highly value add which not a lot of other competitors will be able to do. The importance of final product will also mean a tight partnership with AMAT. Somehow, a partnership with an establish partner may sharpen and expand competency. The jury is still out whether they can make use of these competency and snag further deals away from the semi conductor industry. UMS have tried hard to diversify into oil and gas industry but found limited success. AMAT have this week announced their Q1 results. It ended up beating analyst expectations. 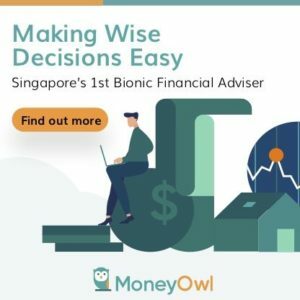 There are interesting transcripts that investors can tune in to which will give you an idea of the business climate. If last quarter was bad for UMS, the next quarter shows a swift recovery. New orders have recovered strongly. AMAT also indicated that Chips should see some moderation and increase in demand for NAND chips. AMAT is also diverting resources from its struggling Solar unit, increasing research and development to Silicon. 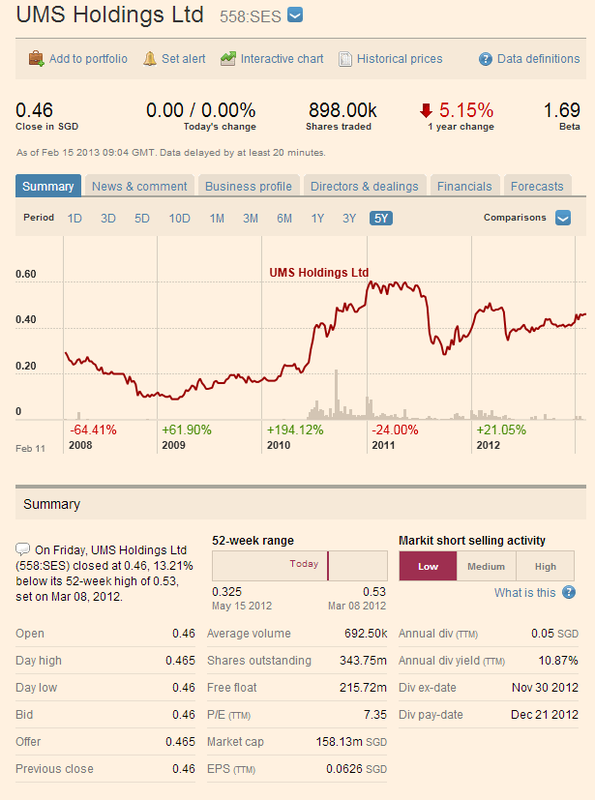 UMS Holdings is really a holding that perhaps make more sense picking up in the down cycle. Like what a valuebuddies forumer says, the dividend is the icing on the cake while waiting for the cycle to recover. The jury is still out whether UMS can operate in such a way that it remains viable regardless of the industry. So far we have not seen the semi conductor industry in a deep funk. I suspect they will not get out well. Yet let us observe a fair bit to see if UMS management surprises us by adding value. We do expect Q4 results to be not good, as per Q3. Hopefully, the cash flow can sustain a 1 cent $3.43 mil dividend payout. under your portfolio tracker, you received dividend for First Reit on 31 Oct 2012 and 21 Nov 2012, I can’t find any dividend record for the 21 Nov 2012? Which platform are you using for the ums mkt information?